Ok, no offense to the good people who were probably forced to have their photo taken in kindergarten class style for this grocery store advertorial. But shame on the person that designed the uniforms. Maybe this is unfair. For one reason or the other, grocery store uniforms seem to be created to be ugly on purpose. I can see no other reason to combine polyester, the color orange, and the purposeless, confusingly angled arm stripes. But why are ugly grocery store uniforms such a universal, worldwide phenomenon? Shouldn't the uniforms reflect the brand image? Do all supermarkets see themselves as lame? If I had to describe Migros on basis on uniform alone, I think I'd say, Happy Halloween (which at least, is appropriate for me to say today. But do you want to be saying that on say, Christmas?). Yep, there's no doubt about it in my mind, Migros uniforms take the prize for being Switzerland's scariest grocery store outfits. But I'm willing to discuss otherwise. Anyone got a good reason why the Coop uniforms are the worst? What do you think of the grocery store fashions in Switzerland? Or in whatever country you happen to be in? But more importantly, would you dress up as a Migros cashier for Halloween? I actually think Coop uniforms aren't so bad. There seem to be multiple articles of clothing (polo shirts, oxford shirts, etc) in a reasonable blue color and the employee can choose which to wear. 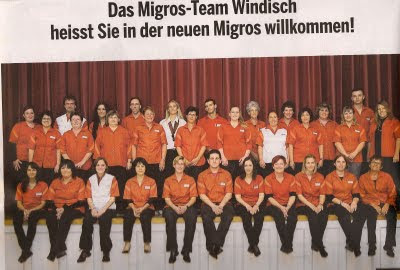 My vote goes to Migros for the worst uniforms too. The thing is... the previous ones were even worse. They looked like some kind of scary hospital robes. Opening on the front, luckily. Scary hospital robes, oh my! Sadly, the Migros-branded packaging isn't much better. I agree. The M-Budget packaging...scary! Orange! Who looks good in orange? ?